The cake stall at a summer fete is easy to find: simply look for the one surrounded by loads of people! With our busy life styles, many of us don’t have time to do much home-baking so homemade cakes and goodies are a welcome treat. Old favourite recipes, like Victoria sponge and scones, are always popular but we’ve selected a couple of recipes that use seasonal food – blueberries and cherries - along with one that looks especially summery with its butterfly wings! A great idea for a summer fete especially if it’s on 4th July! Fresh blueberries are now easily available in the summer. Sieve the flour, salt and baking powder into a bowl. Stir in the sugar. Add the butter in small pieces and, using your fingertips, rub it into the flour until you have a very fine breadcrumb-like mixture. Mix together the egg yolk and cream and, using a fork, stir it into the flour mixture. Draw it together with your hand and very lightly knead it briefly to give a dough. Wrap in clingfilm and put in the fridge for 30 minutes. Place a baking sheet in the oven and preheat to 200 degrees C, gas mark 6. Divide the pastry into two and roll out half to line a 9” pie dish. 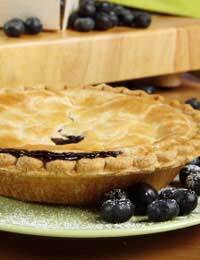 Mix together the blueberries, sugar, flour and lemon juice and place in the pastry base. Dot with the butter. Roll out the other half to cover the pie, crimping the edge carefully to make sure it’s sealed. Make 2 cuts in the middle to allow steam to escape. Put the pie on the hot baking sheet and bake for 10 minutes before reducing the temperature to 180oC, gas mark 4. Continue to cook for another 20 minutes or until golden. Allow to cool and sprinkle generously with icing sugar. An old favourite. We’ve used buttercream in our recipe but you can use whipped double cream if you prefer. Preheat the oven to 180 degrees C, gas mark 4. Cream the margarine and sugar together until light and fluffy. Add the beaten egg gradually. Lightly fold in the flour. Spoon the mixture into paper cases in a bun tray. Bake for 15 to 20 minutes until well-risen and golden. Allow to cool on a cooling tray. Place the softened butter in a bowl and beat well. Add the sieved icing sugar and lemon juice and continue to beat until light and soft. When the cakes are cold, carefully scoop out the top. Cut the piece of cake you’ve removed into 2 semi-circles. Place some buttercream in the cavity you’ve made in each cake and insert the ‘wings’ so they stick up like a butterfly’s. You may like to add tiny strips of angelica to make the butterfly’s antennae! A very simple to make treat that looks spectacular and makes good use of summer fruits. Preheat the oven to 220 degrees C, gas mark 7. Roll out the pastry into a square and cut into 3 equal strips. Place on a baking sheet and prick all over with a fork. Bake for 12 minutes or until well-risen and golden-brown. Remove from the oven and carefully turn over the strips of pastry. Return to the oven for 2 to 3 minutes to crisp. Allow to cool on a wire rack. Meanwhile whip the cream until thick. Halve and stone the cherries. When the pastry is cool, spread 2 slices with jam and top with cream. Place one slice on top of the other and finish off with the ungarnished pastry strip. Gently warm about 4 tablespoons jam and brush over the top layer. Arrange the halved cherries on top and glaze with the remaining jam. Chill.